Bring a bit of American history into your home with our Hardwood Cannonball Bed. Our reproduction looking Cannonball Bed has beautiful turned posts and cannon ball finials. This solid wood Amish made bed became popular in America in the 18th century. It has been a tried and true design since this and retained its American appeal. Our Amish bedroom furniture will be a treasured heirloom for generations. This poster bed is intricately carved to create an inviting bed that will be the focal point of any bedroom. It is available in oak or cherry wood and handcrafted by experienced woodworkers in Lancaster, PA. 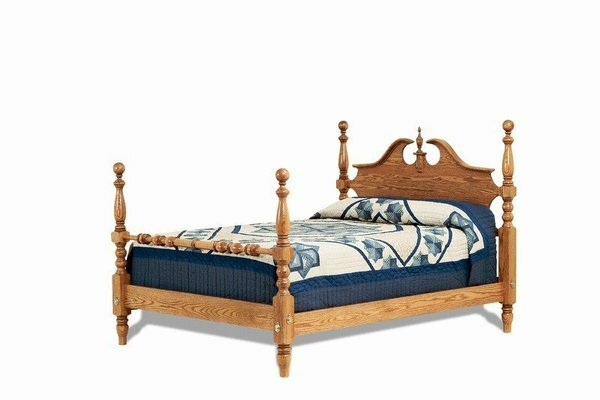 This wood cannonball bed is made with mortise and tenon construction for added strength. The rails are bolted together with a through bolt and barrel nut. Each bed has five slats of which two have center supports on the queen and king beds. Please call one of our Amish furniture specialists for free stain samples or with any questions on our bedroom furniture. Our toll free number is 866-272-6773. Our team of furniture professionals are also easy to reach through email at Questions@DutchCrafters.com. Floor to Bottom of Mattress Height: 10.5"